Frank Corp. Environmental Services is a full service environmental company. We have well trained field and compliance personnel who are qualified to meet the increasing requirements of environmental regulations. Our personnel have years of experience and expertise in heavy equipment operation, construction, environmental remediation, spill response, and safety engineering. We are equipped and organized to service the special needs of Municipalities, Utilities, Industries, and private clients. We are also experienced in marine services and the specials issues of coastal areas. Frank Corp. is available 24/7 for emergency response. Environmental consulting and certified laboratory analysis are part of the range of important services we offer. Our main office is open Monday thru Friday 8 a.m. to 4 p.m. We provide services throughout New England. Our wide range of equipment capabilities allows for flexibility in the field. This is essential in the environmental business and enables us to provide timely and comprehensive environmental services. Frank Corp.’s fleet ranges from our Marine Response Barge to Vacuum Trailers, Vacuum Trucks, Frac Tanks, Flat Bed Trailers, Dump Trailers, Box Trucks, Rack Trucks and completely outfitted Emergency Response Vans for clean up and transportation. We also have Bobcats, Backhoes and large excavating equipment. Quality has been the key to our longevity and success. Frank Corp.’s customers have come to appreciate the attention we pay to the “total quality management” approach to project control. Auditing procedures are part of a complete quality program that ensures each task in every project is approached and accomplished to quality specifications. Frank Corp.’s commitment to customer interaction and continuous reporting has developed into an industry hallmark. Often, as projects unfold, conditions change. We maintain continuous quality assurance through the course of each project and carry pollution liability insurance. 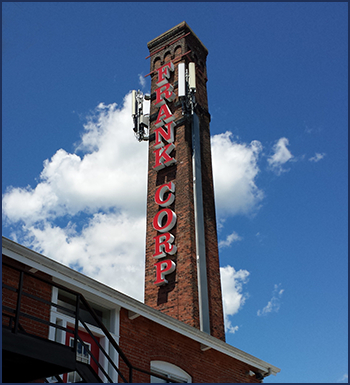 Frank Corp. started in 1956 as a pumping company. Frank Corp. grew into a Construction Company with expertise in the underground utilities field. It was a natural progression to expand into the environmental business which we did in 1989. Payment We accept all methods of payment: Cash, Checks and Credit Card (Visa, MasterCard, American Express).